International students handed over thousands of signed petitions calling for travel concessions for international students to Greens MLC Mehreen Faruqi outside state parliament on August 14. New South Wales is the only state that does not provide travel concessions for international students. With the release of the full text of the Comprehensive and Progressive Agreement for Trans-Pacific Partnership (CPTPP) on February 21, activists in the 11 signatory countries finally got to see if their worst fears of a corporate power grab would be confirmed. In Tokyo on January 24, 11 Pacific Rim countries including Australia reached an agreement to sign a revived Trans-Pacific Partnership (rebranded the Comprehensive and Progressive Agreement for Trans-Pacific Partnership, CPTPP). The huge free trade deal almost fell into oblivion last year when US President Donald Trump pulled his country out, citing concerns for the loss of US jobs. Benny Wenda addressing public forum in Sydney. May 24. West Papuan independence leader Benny Wenda has been touring Australia, spreading awareness of the West Papuan struggle for freedom from Indonesian rule. A cost-benefit analysis released by the Secretariat of Pacific Communities (SPC) and the European Union on potential deep sea mining (DSM) projects in three Pacific countries found that the projects can be viable. But other research suggests there remain serious concerns about the new, untested DSM industry. A new report has found huge tax evasion by foreign logging companies that are running rampant in Papua New Guinea. The Great Timber Heist was released by the Oakland Institute on February 16. The PNG rainforest is the third largest in the world. It covers about 80% of the country, 60% of which is untouched forest. Democratic presidential nominee Bernie Sanders came close to winning the Iowa caucus on February 1. His opponent Hillary Clinton got 49.9% while Sanders got 49.6%. This was a remarkable achievement for a candidate who many commentators said was too radical and stood no chance against the well-entrenched and well-resourced Clinton. The secret text of the Trans-Pacific Partnership was released on November 5 and was swiftly condemned by green groups around the world, which said the trade agreement fails to provide adequate protections for the environment. The TPP was agreed to on September 5 by the US, Australia, Singapore, New Zealand, Chile, Brunei, Canada, Malaysia, Mexico, Peru, Vietnam and Japan. These countries represent about 40% of global GDP. Negotiations on the Trans-Pacific Partnership (TPP) were finally completed in Atlanta on October 5. Final agreement on the treaty had been delayed for years as negotiating countries tried to protect their own industries while trying to gain market access in others. The TPP was negotiated by countries on the Pacific Rim: the US, Australia, Singapore, New Zealand, Chile, Brunei, Canada, Malaysia, Mexico, Peru, Vietnam and Japan. These countries represent about 40% of global GDP. 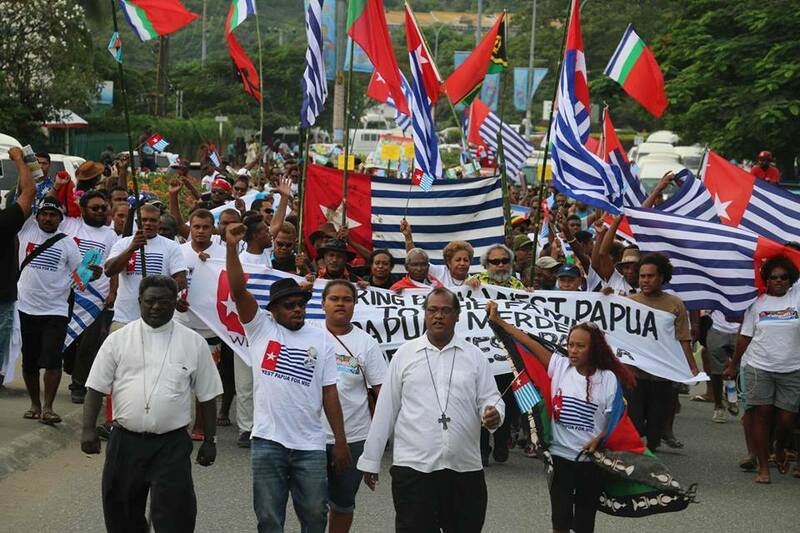 Demonstration in solidarity with West Papua. Honiara, Solomon Islands. Indonesian police beat two West Papuan students in Yahukimo, Papua Province, on September 16 for handing out leaflets about the Pacific Islands Forum.